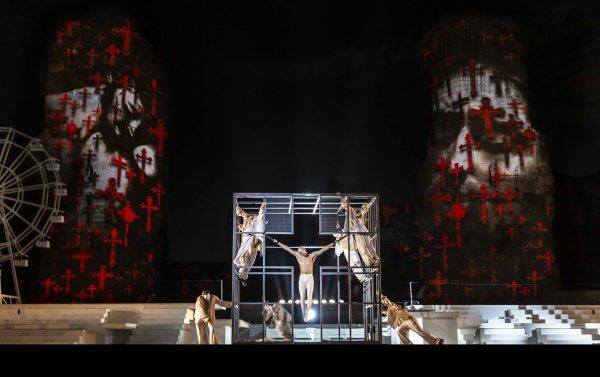 The Ballet of Rome was presenting Romeo & Juliet in the magnificent frame offered by the Baths of Caracalla, in the area of Rome, from July 27th to August 4th. The ruins of the baths built in the 3rd century BC, are a wonderful surroundings to follow the tragic story of the two most famous Verona’s lovers and their impossible love. Giuliano Peparini is a former dancer of the Ballet of Marseille (France) and was “Etoile” under Roland Petit’s direction before being choreographer. One can indeed recognize Roland Petit’s influence in the way of choreographing and especially in the “pas-de-deux” which are very fluent and full of sensuality. The choreography is therefore deeply rooted in a French neo-classicism in which Giuliano Peparini draws some non-academic steps like somersaults or other acrobatic figures. It is not very new but contributes to create an interesting cleavage between the two opposing families, while making the show a touch of modernity. The prologue introduces children from the Ballet School and refers to the theatrical origins of Shakespeare’s masterpiece. 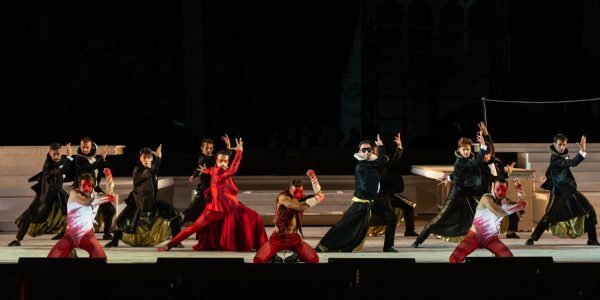 It suddenly contrasts with the energy of the meeting between the two rival camps represented with on one side a group composed by dancers of the Ballet of Rome and on the other side a group of “breakdancers”. 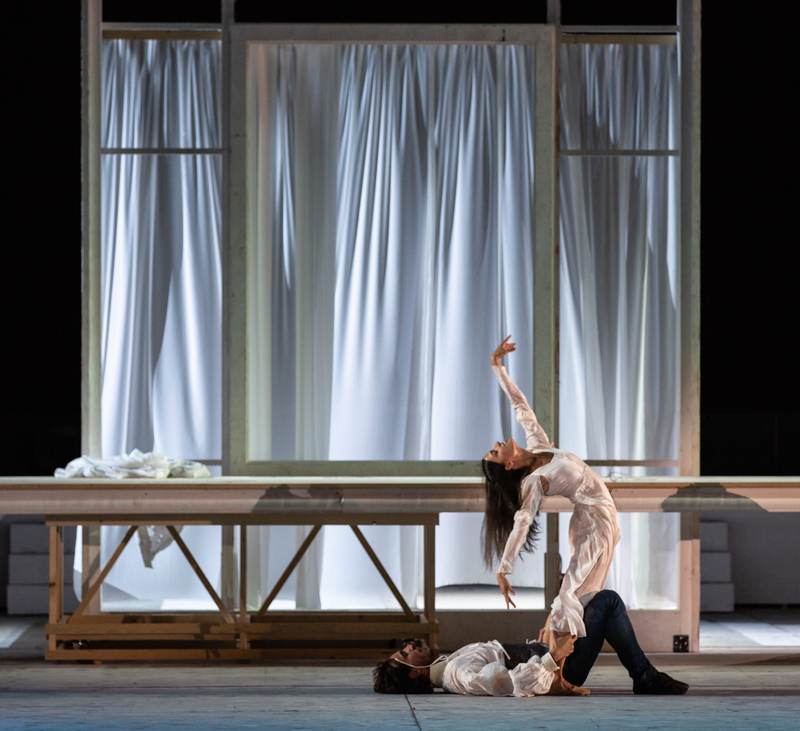 Giuliano Peparini gives to the story of Romeo and Juliet a timelessness nature, and not only in the choreography. 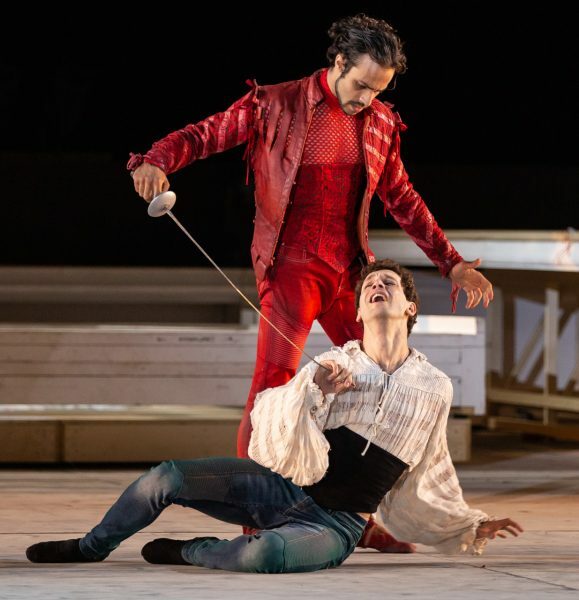 The costumes designed by Frédéric Olivier are very esthetic and conceived in the same spirit: they are faithful to the original story’s period while having a modern touch. It is a very successful mix of modern and old. The male dancers wear jeans combined with shirts with puff sleeves and neck frills, and sometimes even sneakers, while the female wear a variety of long dresses. The scenery designed by Lucia d’Angelo and Cristina Querzola is elegant and sober but also very ingenious to be easily disposable on an open-air stage. The lights by Jean-Michel Désiré highlight the magnificence of the ruins background to create an interesting atmosphere evocating Verona. The very demanding choreography is very well performed by the “Corps de Ballet”. 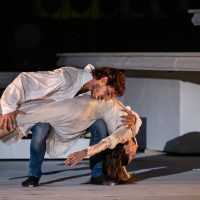 The soloists Susanna Salvi as Juliet and Claudio Cocino as Romeo are very moving in their performance and give all its freshness to this innocent and pure love. Alessio Rezza is very energetic as Mercuzio while Jacopo Giarda is a splendid and very playful Tebaldo. 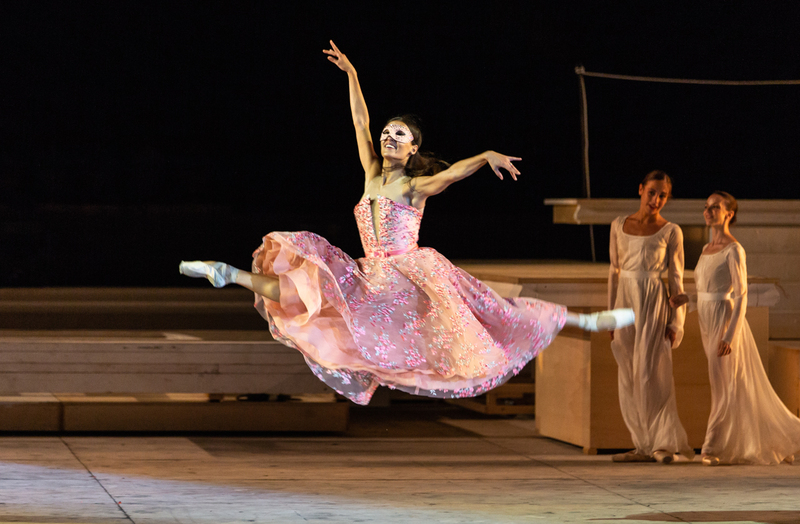 The “Etoile” Alessandra Amato who dances the role of The Death shows a real virtuosity. Even if the story is very well-known, the narration is sometimes a little bit confused like during the ballroom scene. But this might be due to the size of the stage, which is quite small and makes difficult the groups parts. The majestic music of Prokofiev is played live by the orchestra conducted by David Levi, which adds a special charm to the evening. The Baths of Caracalla have been an annual meeting for years and is now a traditional summer stage for Ballets, but also Concerts and Operas. 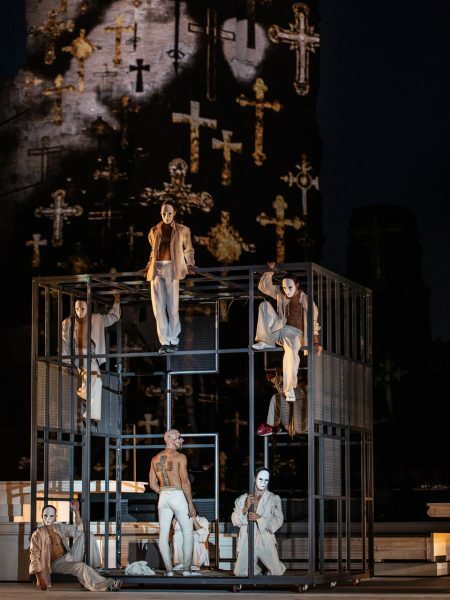 This fantastic place offers such an incredible atmosphere and has hosted many prestigious companies such as the Bolshoi Ballet and the Royal Ballet among others, and more recently Roberto Bolle, with his group “Roberto Bolle and Friends”. The ruins, the live music, the Roman climate, every detail converges to give to this festival a unique esthetic and a romantic charm. 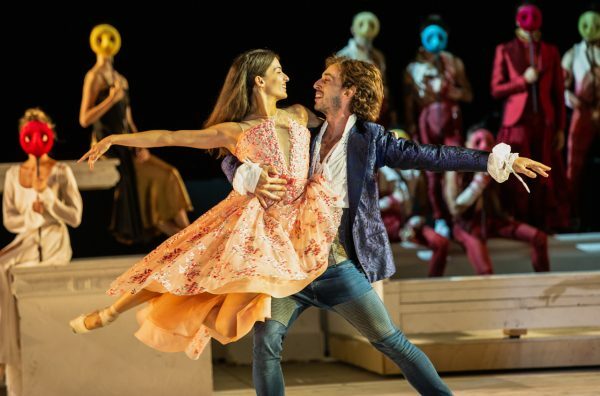 The new Ballet season of the Opera of Rome will open on October 15th with the premiere of Don Quixote in a choreography signed by Laurent Hilaire, former Etoile at the Opera de Paris, based on the original version by Mikhail Baryshnikov for the American Ballet Theatre after Marius Petipa and Alexander Gorsky. 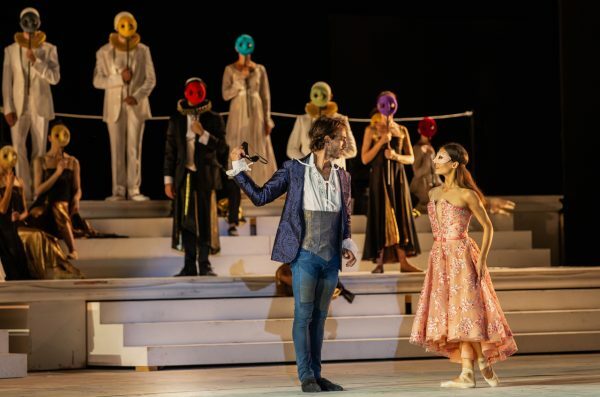 For this occasion, the Opera of Rome will receive prestigious guests such as Evgenia Obratsova, “Etoile” of the Bolshoi Ballet and Isaac Hernandez, lead principal at the English National Ballet.